The Duchess is brought to the croquet ground at Alice's request. She ruminates on finding morals in everything around her. The Queen of Hearts dismisses her on the threat of execution and she introduces Alice to the Gryphon, who takes her to the Mock Turtle. The Mock Turtle is very sad, even though he has no sorrow. He tries to tell his story about how he used to be a real turtle in school, which the Gryphon interrupts so they can play a game. 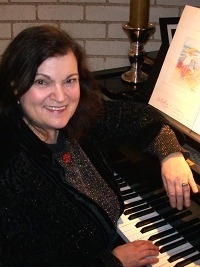 Carol Worthey is a RENAISSANCE WOMAN who has been recognized by awards in classical music, visual and literary art. As a multi-award winning artist, composer, educator, poet, writer, humanitarian and Toastmaster, Carol has devoted her life to creating multi-genre musical and artistic masterpieces. A champion of women's music, Carol has been honored with the Mu Phi Epsilon ACME Award. Her article "Intriguing Counterpoint" on music and painting is featured in the 2007 IAWM Journal. Known for her lyricism, drama, passion and beauty, Worthey began composing at the age of three-and-a-half. Among her mentors are Leonard Bernstein, Darius Milhaud and Vincent Persichetti. Since then, her powerful and deeply moving compositions have been performed on three continents, gracing top venues from Carnegie Hall to St. Martin-in-The-Fields. While Carol prefers to compose concert music, she is equally adept at composing music for various instruments combinations in various genres, including film music, contemporary jazz, pop and musical theatre. Her "Jade Flute in Lo-Yang" for Dizi, Erhu, Pipa and Symphony Orchestra which combines elements of Chinese and western music was world-premiered in Beijing, China. Her "Fanfare for the New Renaissance" for brass ensemble was world-premiered in Florence and won a Special Recognition Award from the City of Florence and the Florence Biennale International Contemporary Art Exhibit in December 2007. Carol's paintings are in the permanent collection of two museums. An estimated 650,000 visitors saw her interactive music and art sculpture "Angel of Music". To give a voice to multiple genres, sight and sound, feeling and intellect, that is what makes Carol's artistic creations exciting and memorable.